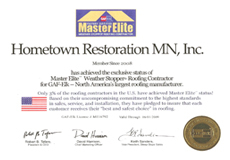 At Hometown Restoration Minnesota, we are proud of our superior artistry and consumer approval for our installation, repair or replacement of windows, siding, roofing, gutters and insulation. Our installers are professionals in their trade and provide exceptional workmanship. They are the best in the industry. We offer a slew of other services that we are pleased to recommend to our clients. We concentrate heavily on exterior home restoration. We will also help with painting any portion of the home that you want, whether indoor or outdoor. 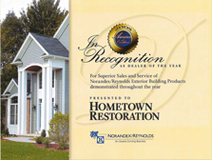 Our main goal is to help restore your house to a new and improved state. We understand that some homes fall within the bounds of homeowners associations. We are more than willing to work within the rules of these associations, still offering you the same great services, detailed to the instructions established by the association your home is connected with. We will work directly both with the management of your local association and you to ensure that satisfaction is gained on both ends. Due to severe weather, many homes in the area have sustained hail or wind damage to their roofs, siding and gutters. Most homeowners are unaware of the damage created by a hail or windstorm event. Hometown Restoration has helped process thousands of insurance claims and use that experience to advocate on your behalf to ensure all damage is identified and payment made that will cover the cost of all needed repairs. We will keep you thoroughly informed from inspection to project completion. Let our team of professional field representatives, skilled installers, and courteous management work with you to ensure your project is completed to your complete satisfaction and to our superior standards. We promise to treat your home as if our own. Hail Can be Damaging - Don’t Let it Damage You in Minnesota! One of the most damaging weather elements is that of hail. Hail is harder than snow and thus can harm your roof to the point that it needs to be heavily repaired or replaced. After a major hailstorm, check your roof for signs of damage. If your roof needs some repair or replacing, count on us to do the job. We are expert at repairing or replacing roofs, including those damaged by hail. 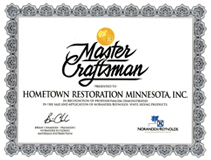 When a bad windstorm has damaged your home, count on Hometown Restoration in Minnesota to repair and replace everything damaged by wind damage. We are expert at repairing roofs, walls, windows, floors, and ceilings and helping your home become the haven that it previously was. Wind damage can wreck your home and cause extensive damage, but it does not have to ruin your life forever. Count on us to get the job done safely, well, and in a timely manner.